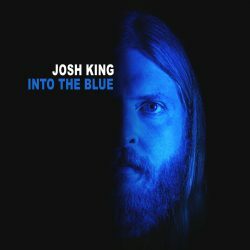 Josh King’s solo debut album ‘Into The Blue’ is a deeply personal Americana album, which differs strongly from the indie-rock music he’s renowned for as the front man for the band House of Fools. A lot of the album comes from a dark period in King’s life as he battled with drugs and trying to leave his reckless young days behind him. ‘Follow Through,’ for example, was written after a cocaine bender; instead of sobering up in the morning he went to meet his dealer to get more. The song ends with him admitting that he wishes that he didn’t go through with his plans to get more coke. The juxtaposition of the happy poppy guitar backing with the dark lyrics really does make a great song, despite the story behind it. The title track ‘Into The Blue’ comes from a time in King’s life when all seemed lost, but a change in lifestyle leads him to having a different outlook on life. His great songwriting abilities are shown with lyrics like “the devil tried to take me for an early ride.” King really does have a gift for songwriting. Josh King has clearly found his voice with his debut album and with his personal songwriting and storytelling skills is laid bare the troubled period in his life. Although it deals with a dark theme, he manages to keep us interested and involved with his music and lyric styles.